As always, part of the morning routine is to check the weather along the route one more time. Today, there was a strong possibility of rain in the last 2 towns starting around 4 PM. By 5 PM, there was a 70% chance of rain in Holly, my destination for the day, 85 miles away. 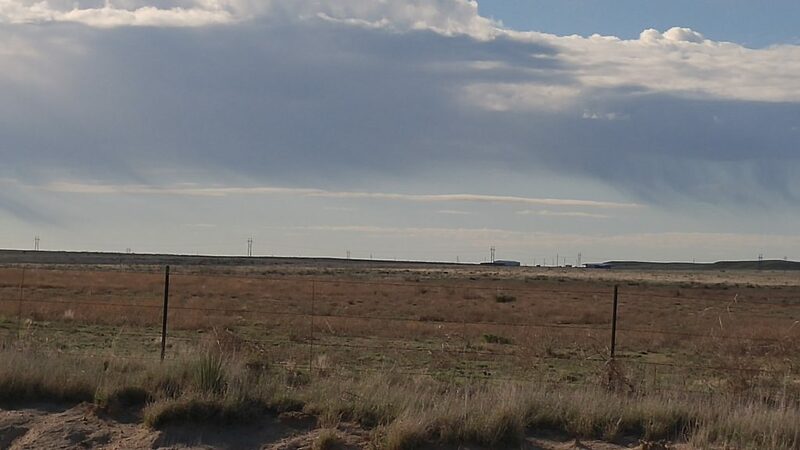 I wanted to get an early start as my goal was to beat the rain in the race to Holly, CO.
Just outside of La Junta, I could see rain in the southeast, moving towards the next town. I was on the bike at 7:30, my earliest start for the trip so far. I cut through town, but still could see the railroad tracks not far away. 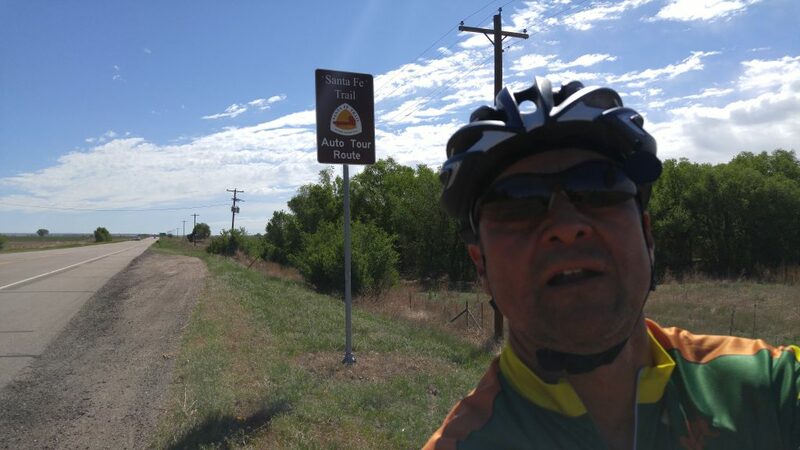 For the last few days I have been riding along the Santa Fe Trail. 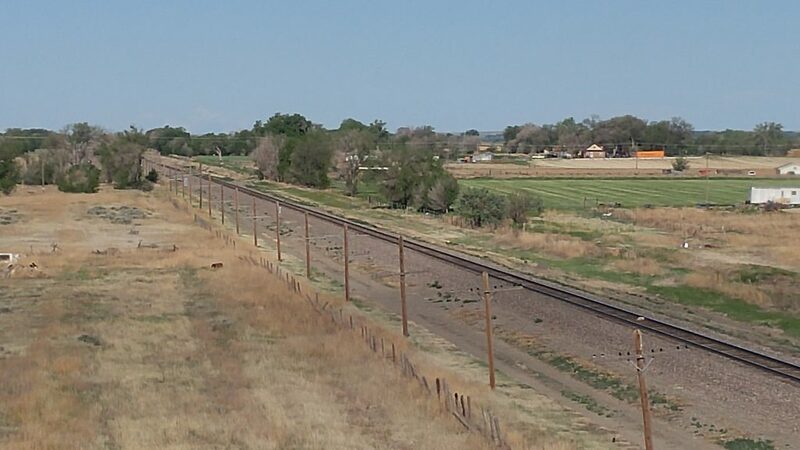 The Santa Fe railroad line was still operating. A strange noise caught my attention and I looked to my left. 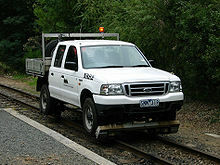 I saw a large pickup truck driving on the railroad tracks. It was not getting bumped around because it was on some special device that let it ride the rails. I didn’t get a picture, but it looked a lot like this. The railroad was key to all the towns I passed through, but most had seen better days. While the agriculture is still strong, the local businesses and associated commerce were weak. I saw a lot of empty retail real estate in the heart of the towns. It was easy to see that one used to be the hardware store, another used to be a furniture store, etc. As long as I could get something to drink and use the restroom at the Loaf and Jug gas station/mini-mart, my needs were going to be satisfied. 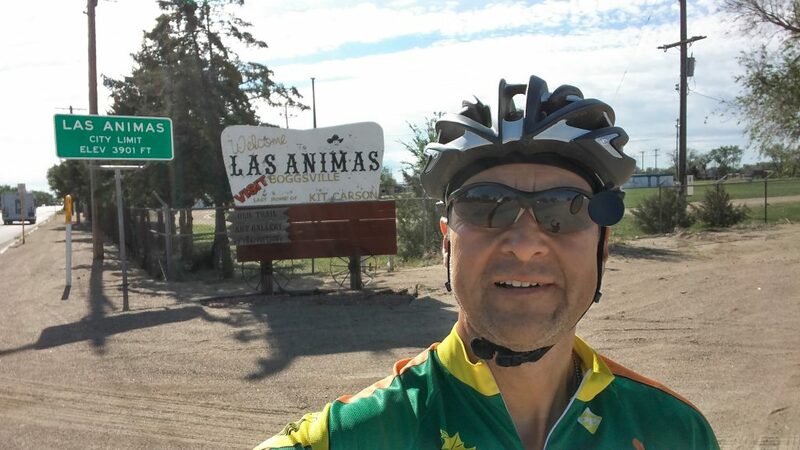 At my first stop, 20 miles down the road, I had a chance to take care of the essentials at a Loaf and Jug in Las Animas. According to the sign at the edge of town, it is the final home of Kit Carson, the American frontiersman. 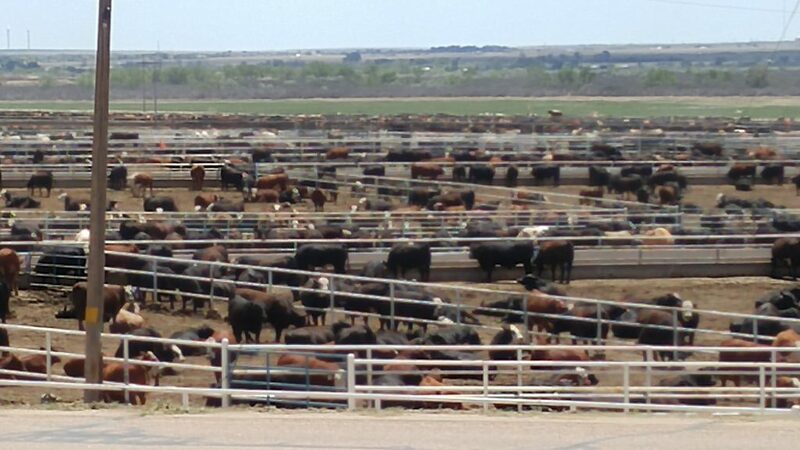 This stockyard outside Las Animas was at least a quarter mile square. It was long 38 miles to text town, Lamar. Mike met me before then to replenish my water. I wasn’t hurting, because the weather was still mild and there was a breeze. Sometimes the light wind helped and sometimes it didn’t depending on its direction. It was easy to tell the difference in the difficulty of pedaling. 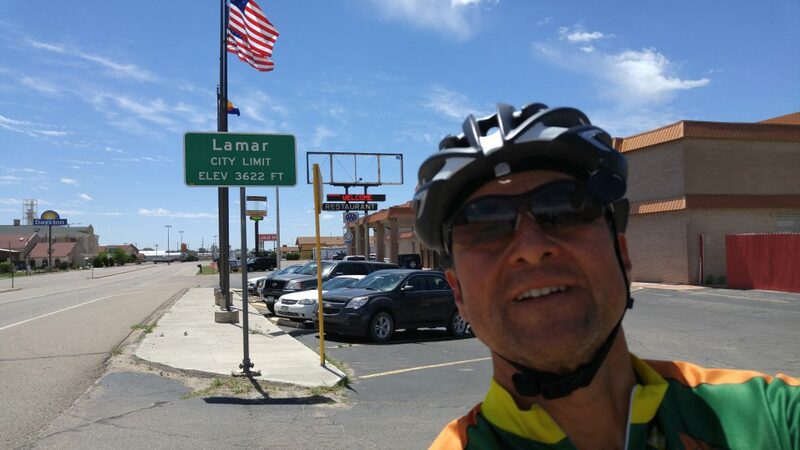 Before reaching Lamar, I saw my first adventure cyclist since I entered Colorado. He was going the opposite direction on the divided highway. From the way he was loaded, it looked like he was camping, not hoteling, like me. I waved to him and he did the same and when I stopped to take his picture, he had also stopped. 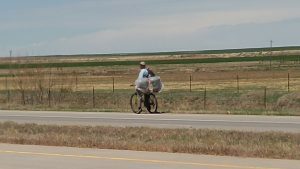 I yelled “Where are you headed?” With the traffic noise and the distance across the divided highway, I couldn’t tell if he said Pittsburgh or Pacific. I’m guessing Pacific. I yelled back “Atlantic” and continued on to Lamar. Mike had already scoped out the eating possibilities. We settled on a Subway, where we got a sandwich and a lot to drink, then headed down the road to Granada, 18 miles away. 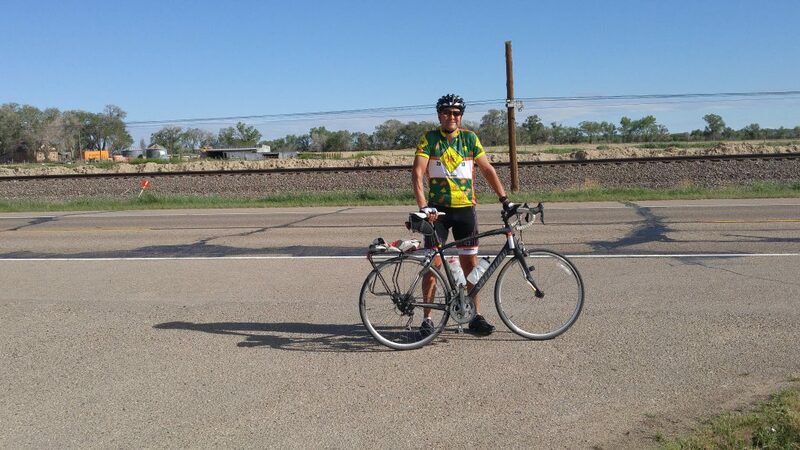 The wind was not friendly and I had to work hard to maintain even 13 mph. The mental jukebox was already replaying the Allan Sherman hit … “Hello mudda, hello fadda, here I am at Camp Granada..” Just before I reached Granada, I saw a sign referring to the Amache relocation center. At first, I thought it was a reference to moving Native Americans. 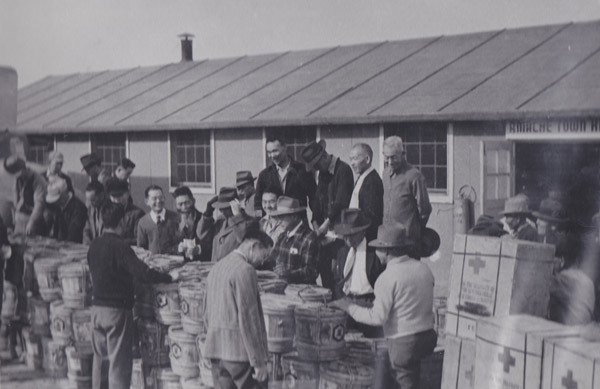 In reality, it was a museum and memorial to the Japanese Americans living on the West Coast who were forced to relocate as part of Executive Order 9066 during WW II. Allan Sherman stopped singing. 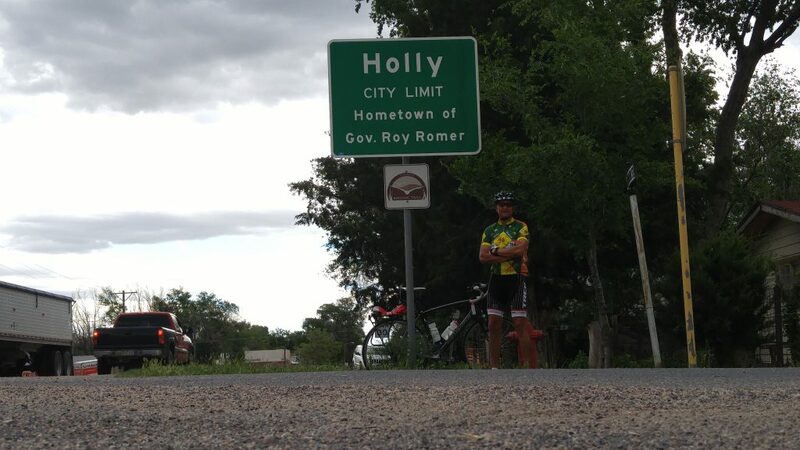 The skies were still sunny 4 miles outside of Holly, my final stop for the day. I did my obligatory picture by the city sign and the skies started getting dark. I found Mike a block down the main road. He had scoped out the town. Granada was twice the physical size of Holly, but had no hotels. Holly did not go more than 5 to 10 blocks in any direction from the center of town, but had 3 motels, a medium sized modern grocery and even a small movie house! When we checked in we asked what drove the development of the new school and homes Mike had seen on the north part of town. The hotel clerk explained that a tornado had come through a few years ago and done quite a bit of damage. They got grants to do rebuilding. The hotel had the 1950s architecture of one story row of rooms, but the interior was completely redesigned with new fixtures, appliances, beds, and now we had hot water again! We decided to hit the deli area of the grocery store for dinner. 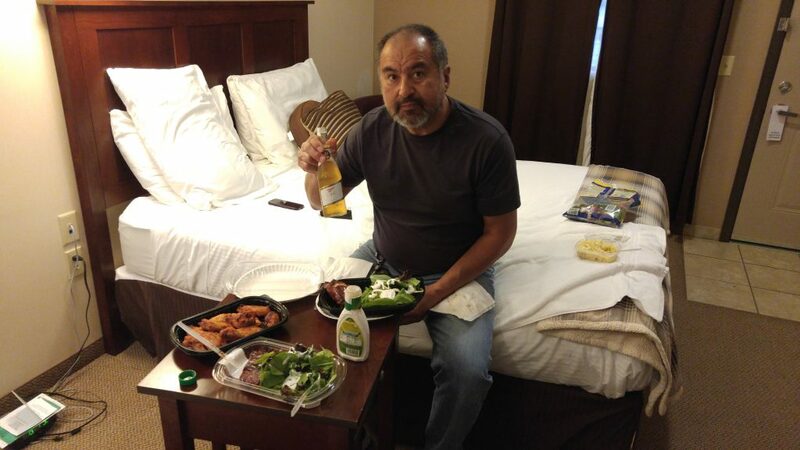 Mike and I ate in the room with ribs, wings, salad, and his last 2 beers. The finish to another good day.